California-based Straw Hat Pizza will open its first franchise in Georgia later this month, in the National Plaza shopping center in Augusta. Shailen Patel, partner, told the Augusta Chronicle that the new Straw Hat unit is a renovated, 2,600-square-foot space that can seat up to 65 customers. It will include the chain's signature game room for children and will offer dine-in, carry out and delivery. Patel added that the location was chosen because it's situated near a busy Publix store and there are no sitting pizzeria restaurants nearby. Patel also plans to open Tower 27 Yogurt, another Straw Hat Restaurants Inc. franchise, inside the restaurant in the near future. Read more about franchising and growth. A Straw Hat Pizza Genuine California Pizzeria franchise is opening in the National Plaza shopping center next to Publix, becoming the company’s first franchise in Georgia. The restaurant at 2816 Washington Road will open in late April or early May, depending on progress for the construction project, partner Shailen Patel said. Patel is renovating the 2,600-square-foot space, which can seat 65 customers. San Ramon, Calif.-based Straw Hat Pizza surveyed the area and selected the location for the franchise, he said. “They found that this was one of the busiest Publix stores in Augusta. From here to the other side, there’s no sitting pizzeria restaurants. That’s why they chose this location,” he said. Patel said he plans to hire 10 to 12 employees and is accepting applications. Straw Hat Pizza is hiring drivers, cooks and servers. Applicants can pick up and drop off applications from 10 a.m. to 2 p.m. daily. Patel, who previously owned Subway and Pizza Inn restaurants in South Carolina, also plans to open Tower 27 Yogurt, another Straw Hat Restaurants Inc. franchise, inside the restaurant in the near future. Straw Hat Pizza serves gourmet pizza and sandwiches and has a salad bar. The Augusta restaurant will also have a game room for children. Straw Hat Pizza will offer dine-in, carry out and delivery. “It is a good franchise because they have a lot of different, very good pizzas. They serve gluten-free crust pizzas,” he said. Straw Hat Pizza began franchising in 1969 and has about 150 restaurants nationwide, Patel said. 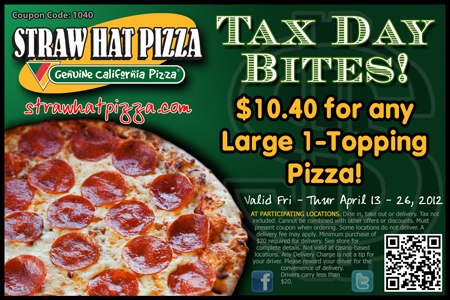 $10.40 for ANY Large 1-Topping Pizza!